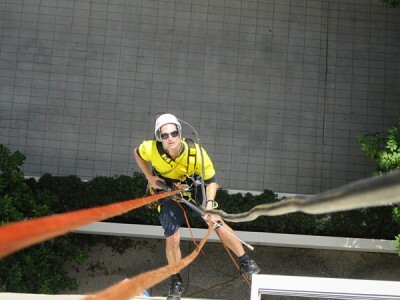 Pinnacle Safety and Training provide specialist rope access contracting for any building or structure where conventional methods of access such as EWPs, cranes, scaffolds etc. are unable to complete the required task. We have experienced technicians able to perform many types of difficult access work such as vegetation control, high pressure/low pressure cleaning, painting and waterproofing, photographic inspection, telecommunications rigging, confined space, sign and banner erection and more. Pinnacle employs experienced level 1, 2 and 3 technicians accredited by IRATA, ARAA and SPRAT as required to ensure compliance with all site requirements. Our technicians are often rope access trainers as well, meaning their technical skills and professionalism are of the highest level. We are experts in supplying professional contract staff for standby rescue situations such as height safety, industrial roping and confined spaces to ensure your compliance with WHS legislation and to minimise risk. Our expert emergency services trained personnel can be despatched to any destination Australia-wide.